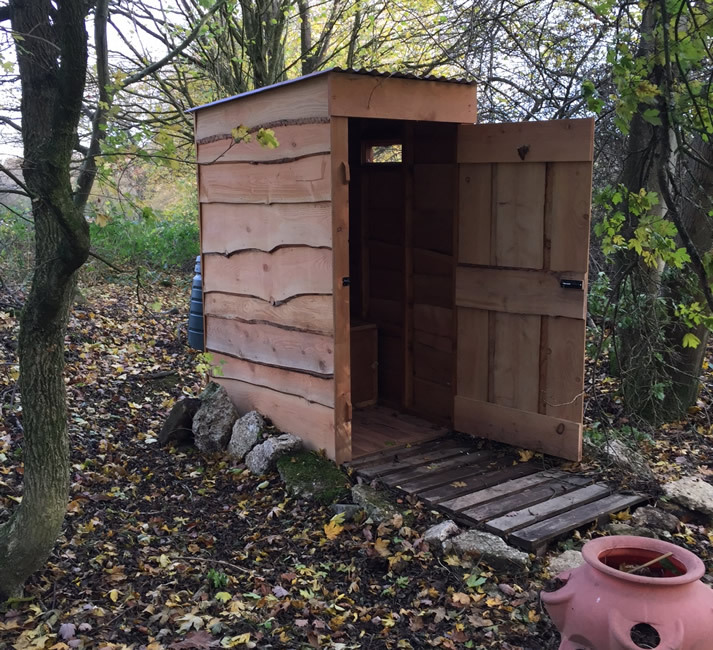 When we were faced with the problem of providing a toilet facility for our own off grid glamping site we decided to design and build our own. 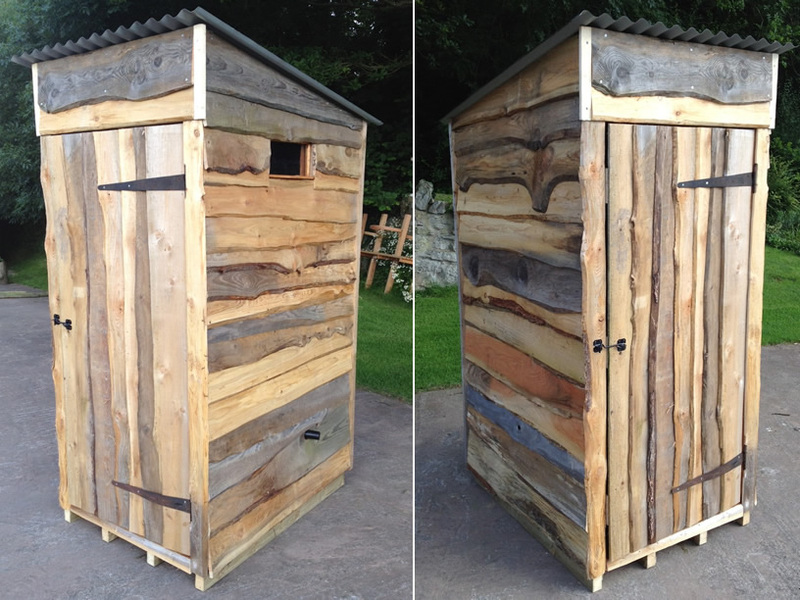 Roll on three years and we now have an excellent cost effective compost loo hut. 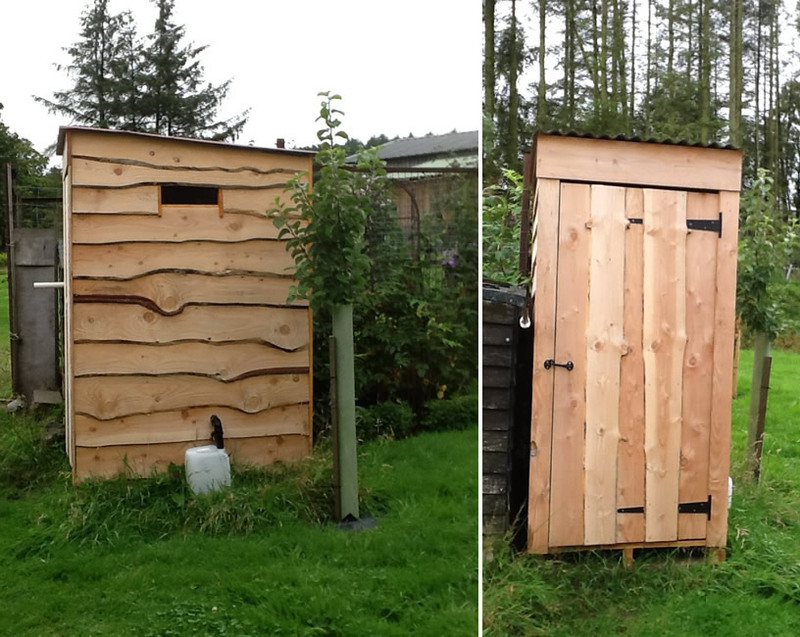 Not only is this a practical, chemical free, easy to maintain and environmentally friendly solution but the attractive design of the hut means it blends well with all surroundings. 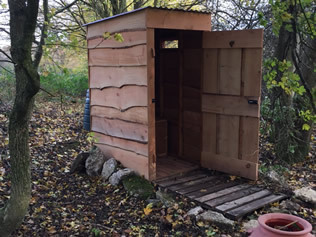 The key to any successful compost loo is the separation of the solids and liquids and this is achieved by way of a urine separator positioned on runners under the loo seat. 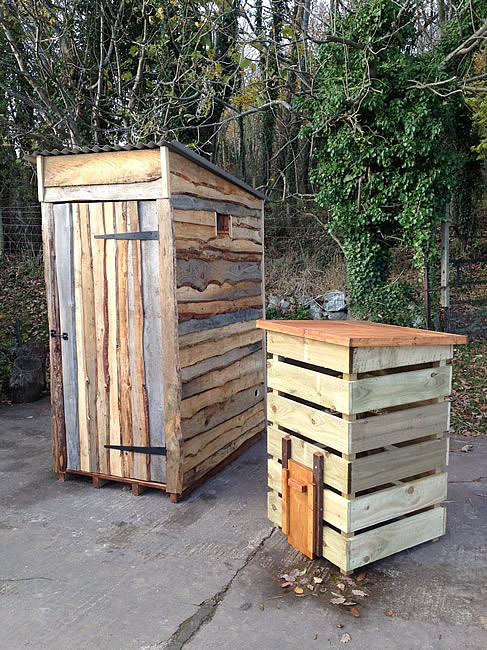 A 69 litre bucket collects the solids and the plumbing diverts the urine to either a soakaway or another container outside the hut. This separation process allows the hut to remain odour free. A handful of sawdust is thrown into the bucket after each use and this helps to provide the balance of carbon and nitrogen required for the decomposition process. 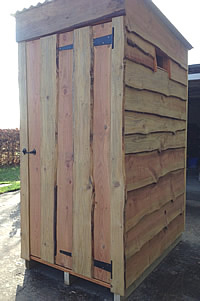 A hatch opening on the back of the hut provides easy access for the bucket to be emptied. 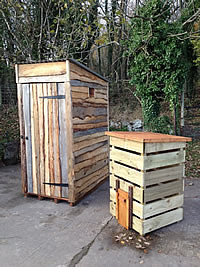 We can also supply a composting box for this purpose. The composting box has spaces between the timbers to allow air (oxygen) in which results in aerobic decomposition and a compost which can be used as a fertiliser. 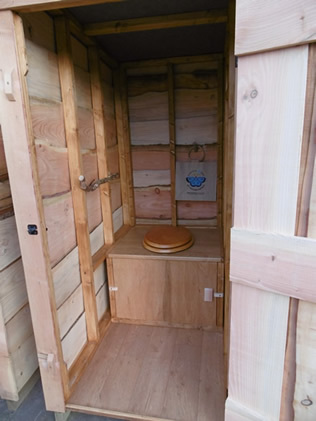 There is another hatch opening under the loo seat base to allow easy access to the urine separator and plumbing for periodic cleaning. This hut is about 40% bigger than the standard version and has enough space for installing a small sink. 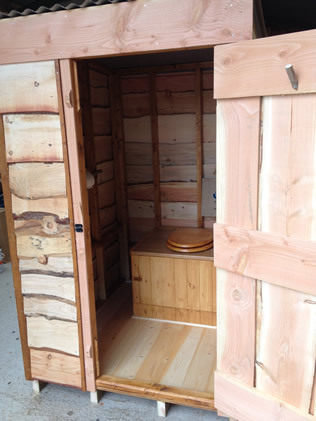 It has a solid wooden floor and the loo can be fitted on the right or the left hand side of the hut. "Our eco-loo has gone down very well at St Mark's, especially as we have had quite a few spring/summer weddings. It fits in comfortably next to another shed already there. 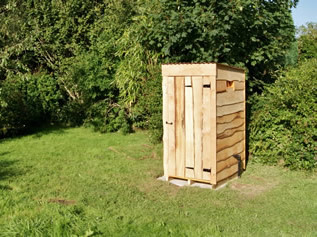 The urine just drains into the small bottle which can be emptied easily and regularly. 10 out of 10!" 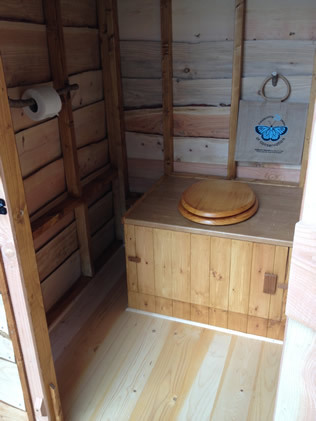 "Just to say the loo is now installed and fits perfectly under the eaves of the log cabin. We are really pleased with it. Thank you so much for all your help and advice. Your customer service has been wonderful." 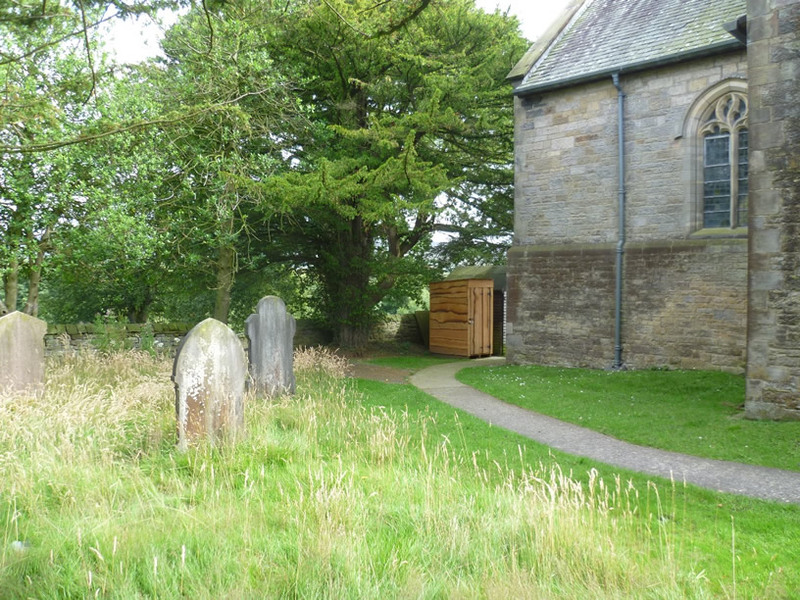 Several positive comments! 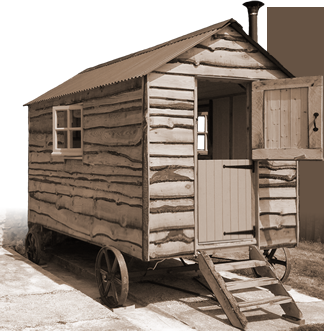 A group inspection of the hut. 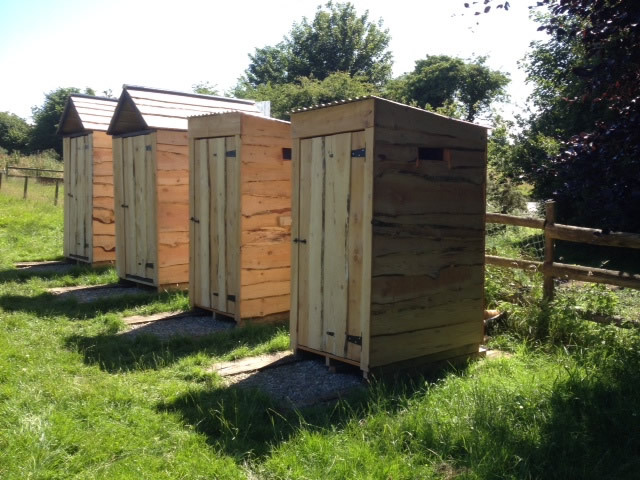 Most have lots of experiences of different dry loos, so were v interested. Handed out your Quirky address too!" 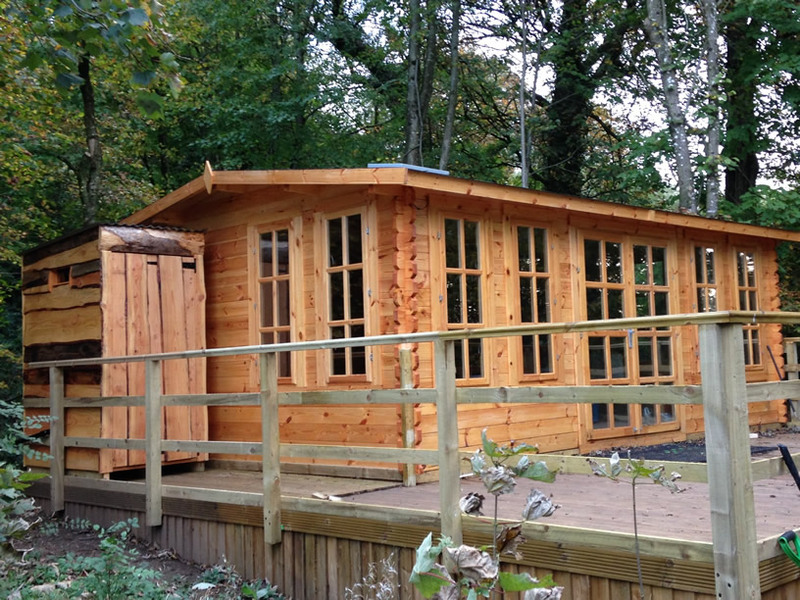 Update: "We can assure you it is brilliant, works perfectly and was a great investment! 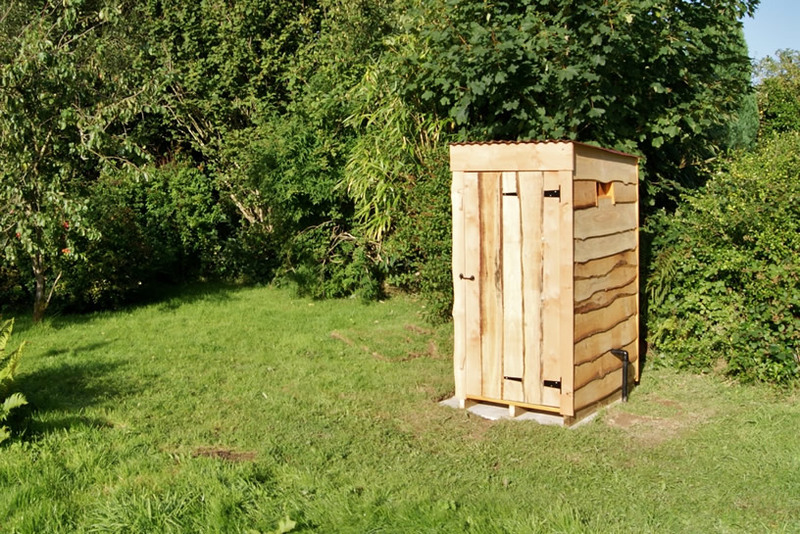 Last year it was twinned with a toilet in India." "Thanks again Tudor. Here you are: They are brilliant; sorry for the delay in getting these to you we don't have broadband at the site." 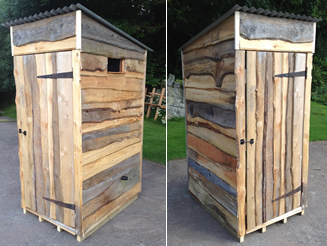 "Here are a couple of picture of the composting loo in situ here at our campsite. The loo is proving very popular with our campers and we are absolutely delighted with it." 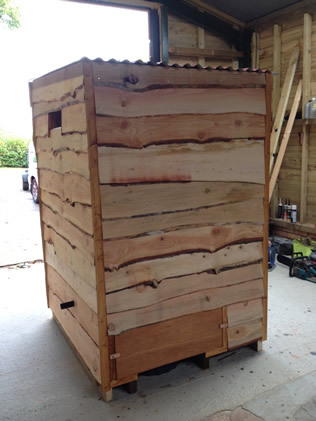 "We bought a brilliant composting toilet off you back in the spring/early summer. 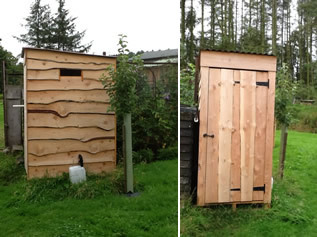 We need 3 more...."
"It [the compost loo hut] turned up yesterday and we're very pleased with it. 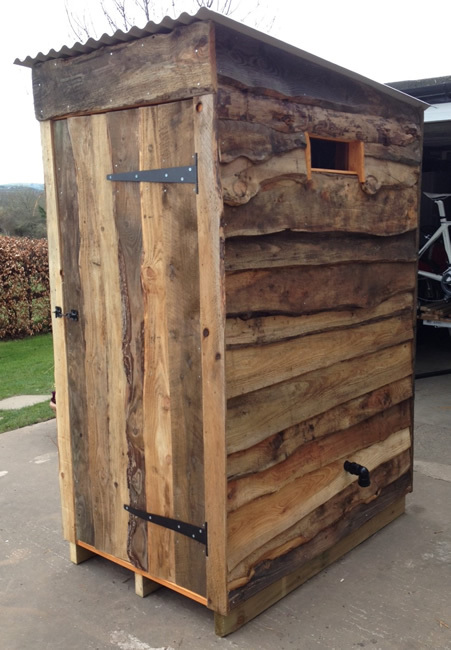 The build quality is excellent and we're looking forward to using it!" 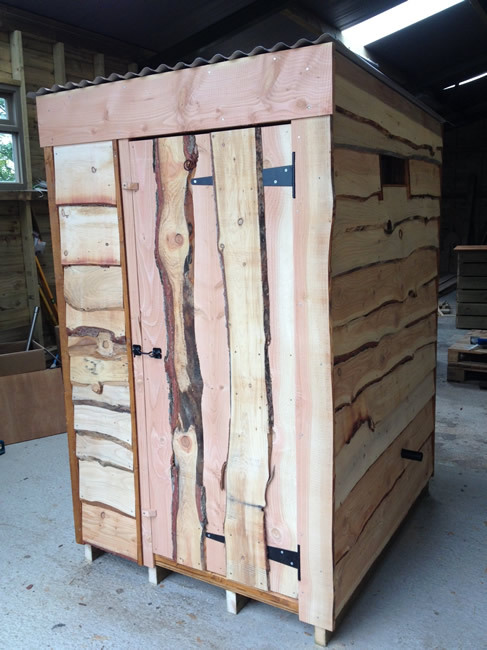 "Really delighted looks amazing. 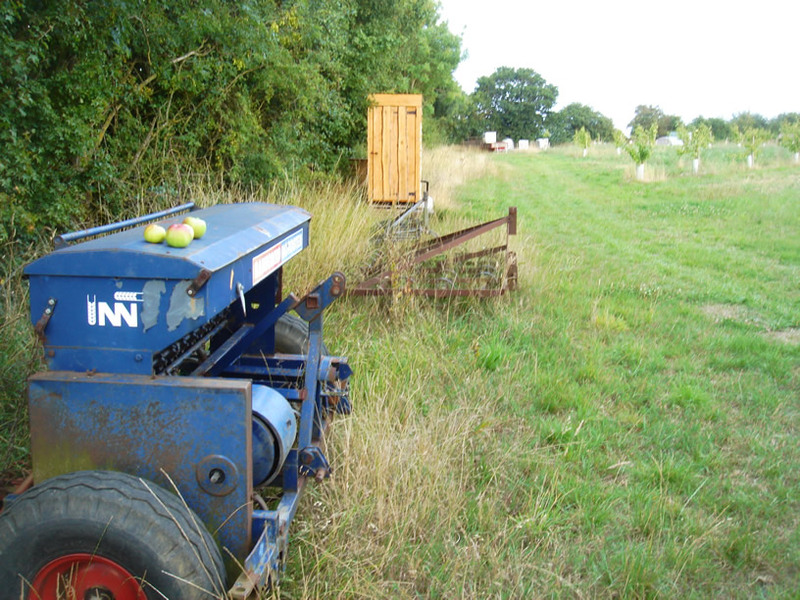 Will be my saviour on long working days outside and a great attraction for our visitors. 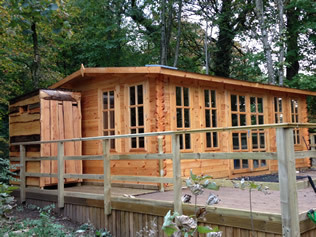 Great product, wonderful service and we are all really delighted a big thankyou."